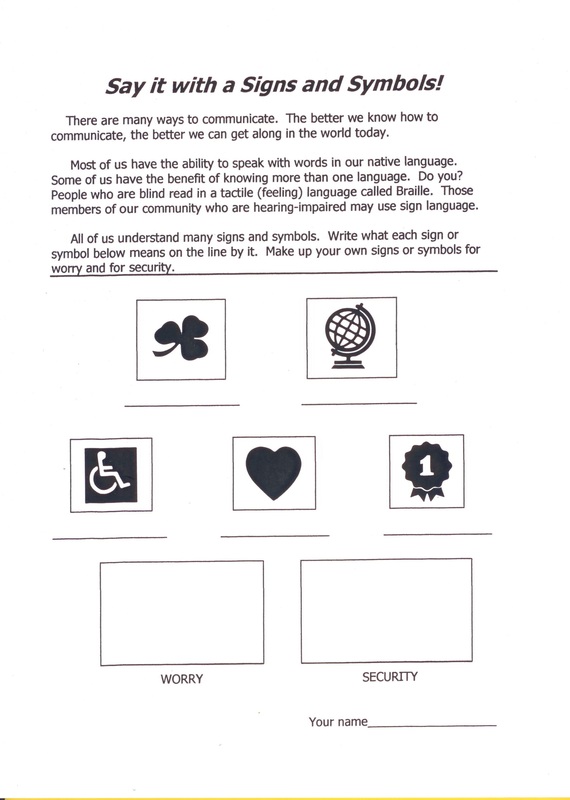 Play a Signs and Symbols game to help children learn the importance of communication. Quickly tap into tools and tricks to catch and keep your students’ attention. Today’s Tip: Play a Game: Say It with Signs and Symbols! Help your students grasp the impact that multiple forms of communication has on our lives today. Kids need to catch on to a key 21st century concept: the better they know how to communicate, the better they will get along. Play a Game – Say it with Signs and Symbols! – Signs and symbols are attention-getting images. Familiar signs and symbols are instantly identifiable. Help kids learn to recognize signs and symbols as powerful forms of communication. Make a master to copy for students of popular signs and symbols in your community. Find signs and symbols online or in copy and print shops. Cut and paste the images to a sheet of paper, leaving space between each sign or symbol. Draw a line below each sign or symbol for students to write what they represent. Draw extra boxes for students to create their own signs and symbols. Draw a line below each extra box for students to write what their creative signs and symbols represent. Distribute the copies and start the writing game as a timed event to add excitement to the activity. Review the signs and symbols with the class. Optional: Invite volunteers to share signs and symbols they created. Optional: Hold a class vote for the best original signs and symbols and award prizes. 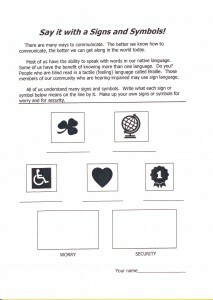 Playing a game of Say it with Signs and Symbols also offers you an opportunity to discuss the special ways that people with disabilities communicate. For example, challenge students to learn some sign language used by people who are hearing-impaired. Show writing in Braille used by people who are blind. Signs and symbols are powerful visuals. Used with powerful words, the communication link will be strong. Look here next Monday for a new feature on The Attentionology Tipster. 1 Pings/Trackbacks for "Play a Game: Say It with Signs and Symbols! – The Attentionology Tipster"